Welcome to the Peachy Keen September Release blog hop! If you started the hop at the PKS Challenge Blog, then you should have hopped her from Viv’s blog. If you arrived here first, be sure to hop on over to the PKS Challenge Blog to catch the first 2 stops of the hop. My hop card features the new face set called Snow Cuties (PK-500 & PK-501). Instructions for making this card is below the blog hop button. I'm also excited that my design is one of the new CottageCutz dies called Herby. You can see him HERE. There are so many other AWESOME new halloween dies. You just have to see them all HERE. Also, be sure to leave a comment here, as I'll be drawing a random name to win the Snow Cuties Assortment stamp set, courtesy of PKS! The other DT members are also offering goodies, so be sure to check out all of the stops on the blog hop. Oh, and don't forget to start at the PKS Challenge blog. If you leave a comment there, you could win a Copic Marker Set!! All punches used are Stampin’ Up! Punch 2 1/2” Circle, 1 3/4” Circle & Ornament in textured white. 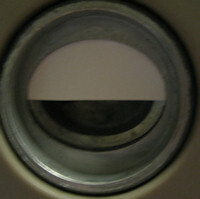 For arm, punch half of the Medium Oval, then line up the Large Oval over the top of the punched hole and punch the arm as shown. Round out the sharp edges of the punched arm. Punch 3/4” Circle for one hand. Punch 1 1/4” Square in black, Word Window in black and one third of the 1 1/4” Square in a color of choice for the hat band. Use the Crop-a-dile to punch 3 of the smallest circles for the holly berries. Cut 2 small rectangles. Use a 1/4” circle and punch around the outer edges to create the holly leaves. Punch 3 of the 1/4” Circles for buttons and the smallest heart from Heart to Heart for the chest. Stamp the snowboy face onto the ornament using the Snow Cuties 1 1/8” stamp (PK-501). Sponge the edges of the white pieces with soft sky ink. Attach the 1 3/4” Circle at the top of the 2 1/2” circle with dimensionals. Attach the head to the body with dimensionals. Glue hat band onto hat. Clip away a little on each side at an angle so that the square is narrower at the bottom. Attach the word window onto the square with dimensionals. Glue holly leaves and berries onto hat. Attach hat to head with dimensionals. Attach arm and heart with dimensional. Glue on buttons. Punch 1 3/4” Circle, 1 3/8” Circle & 1 1/4” Circle in textured white. For arm, punch half of the 3/4” Circle, then line up the Small Oval over the top of the punched hole and punch the arm like you did for the snowboy. Round out the sharp edges of the punched arm. Make 2 arms. Stamp the snowgirl face onto the 1 1/4” Circle using the Snow Cuties Assortment stamps 1” size (PK-500). Sponge the edges of the white pieces with soft sky ink. Attach the 1 3/8” Circle at the top of the 1 3/4” circle with dimensionals. Attach the head to the body with dimensionals (tilt the head towards the snowboy). Attach the arms and heart with dimensionals. Attach snowgirl to front of snowboy with dimensionals. Attach snowboy hand onto snowgirl shoulder with dimensional. For the basic card assembly, follow the instructions for a Tent Card in the SCS Resources Section HERE. For card base, cut 5 1/2” x 11” baha breeze cardstock. For inside of card, cut 5 1/2” x 4”. I used a retired Stampin’ Up! DSP called Ski Slope. The new Stampin’ Up! DSP called Candy Cane would be a great substitute. Cut striped paper for the front 5 1/4” x 5 1/4”. Cut snowflake print for inside 5 1/4” x 5 1/4”. I used the Nestabilities Petite Circles (largest) and the Nestabilities Scallop Circle (largest) for the window on the front. The greeting from SU! Bright Christmas is stamped in real red and cut out with the Nestabilities Mega Ovals. You can’t see in the picture, but the words are outlined with a stardust pen to add shimmer. Card is embellished with the SU! Red satin ribbon. Are you loving all of the new PKS stamps? Now is your chance to get them on sale! How adorable are they?! I LOVE your cute snowman and your tutorials are always the best! This card had me smiling from ear to ear. These are so cute and you make it look so easy. Thanks for the chance to win. Oh my goodness these little snowmen are the cutest. I love their faces! Too sweet. Love your snowmen car !!!! This is really adorable. I listed the snow faces as my favorites:) I really love these:) TFS!! Wow Kim!! You are truly a talented individual with an extremly crafty mind. Welcome aboard the PKS DT. How you come up with this stuff just amazes me!!! Absolutely adorable!!!! I love how you did the faces on the snowmen! Awesome card!!!!! Great snowman. I love that you used punches. Too cute. Love your spirit and creativity. Thanks for sharing and an opportunity to win! So cute.... Thanks for sharing. I just love the snow faces! SUPER CUTE!!! Thank you for all the instructions!!!!!! I have such a weakness for snowmen! My Christmas tree is going to have all snowman decorations this year. Thanks for sharing! Love the snowmen. Thanks for sharing your wonderful ideas. Gotta get hoppin'. Catch ya later. Hugs!! Cute, cute, cute! Snowmen are my favorite for the winter seaon. They are so awesome! Thanks for sharing and a chance to win! I also just became a follower of your awesome blog. CUTE CUTE set and I love yoru snow people....this is my first time to your site...going to take a look around...lokks like some fun stuff! Always looking for new inspiration. good morning from the rainy maryland shores! i love snowmen and the card yo umade and explained in such excellent detail is too cute! adorable. Thank you for posting the instructions on how you created these cuties. I LOVE these new faces!!! Great job on the cute snowmen! OH MY WORD!!! These are SOO CUTE Kim!! They are just the sweetest little snow couple EVVAH! I'm fascinated by how cleverly they were punched. You are amazing!!! These little guys are adorable... thanks for sharing the tutorial! The card is ADORABLE! I love your creativity. Thanks for the inspiration and instructions! oh those snow ppl are sooo cute! i love it. thanks so much for sharing and the chance to win! These are super cute Kim!! Love the snowmen!!! Love the card! The snow peoples are just precious, thanks for sharing the tutorial. Oh my gosh! I am going to have to get these faces they are just too cute! TFS! So adorable!! I have to get these, I love the cute faces and the little heart!! Very Cute!! Love your card!! Your tutorials are always the best! I love the snowmen! I think, I found something for my x-mas cards!! Those snow faces are superb.......thanks for sharing the actual process to create these! Just love it the snowmen are super cute. I just ordered the window punch from stamping up! Thanks for the tutorial! I love how you created with just punches! the "snow cutie" ones are my favorite! Very cute! Oh my goodness, what a cutie patootie, of a card. I love it! Thanks for sharing such a cute card!! Love the things you do, cant wait to see more! Oh my gosh this is just too dang cute!! I have GOT to get those stamps.... please oh please let me win!! Thank you so much.. I am now a follower! From the sneak peeks I couldn't wait to see what you were doing (I love snowpeople.) I was not disappointed, very cute card! These are soooo cute, Kim! That's a great tutorial, because I was of course thinking... "Okay, how'd she do those arms?". LOL! Thanks for including that!! I always love your punched creations, and these are particularly adorable! Beautiful job! Supe cute snow people! I love your paper punching. Thanks for sharing! I love snowman. Your card is AMAZING! You have a wonderful blog. Thank you for sharing. Awesome card...love the faces on the Snow people! Too cute!!! Great tutorial, thank you. Your punching creativeness is absolutely amazing! Cute snow buddies! Wow you did a great job with those snowmen they look great!! TFS!! These snowmen are sooo adorable. Love them! Thanks for the instructions! OMGosh! That's absoluteley adorable!!! I love it!!! oh my gosh.. love the snowmen/girl.. i need to buy a med size circle punch now!! love it.. Your snowmen are so adorable. Thanks for the directions. I love this set. You're card is "snow cute" ;) tee hee! Snowman card is adorable!!! I just love all snowman and you made this look so easy. Love the snowmen and thanks so much for the tuts, they are wonderful. Thanks for chance to win the set. Wow! i just love these snowmen! 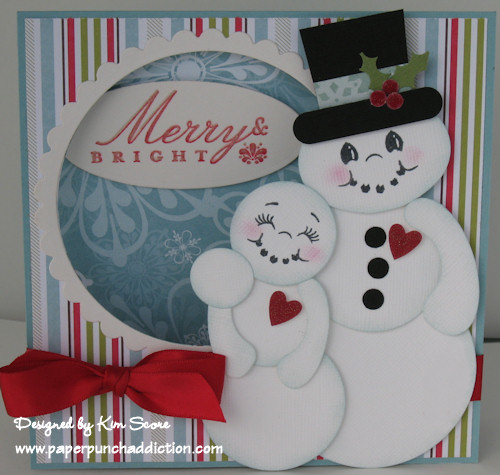 I love how you used the stamp sets, the snowmen look so sweet and friendly. I also like the coordinating papers in the background. Amazing job! That card is just too precious. I love those dies and would love even more to win them. (-: Thanks for sharing and the opportunity to win. I just don't even know where to begin! This is so stinking cute! I love all the details and still amazed about just using punches! Wow! Thank you for the detailed instructions! This is so darn adorable! OMG they are adorable! Thanks for the chance to win! Super cute card. I love snowmen. Thanks for the opportunity to winn this set. Congrats on Herby!.He's so cute, but a little evil one as well. Your card using the Snow Cuties is ABSOLUTELY ADORABLE!!!! So glad I'm hopping about, may have never found your blog. It's great! Oh my goodness! They are a darling snow couple! :) I love love love your card. Thank you so much for the instructions! Beautiful! I just love the cute faces! These snowpeople are ADORABLE! I just love them! me at glorajean dot com. This is so adorable. I love the new face stamps. Thanks for all you share and the time you spend finding punch art samples for us. Thanks too for the chance to wine this cute set. I love your card. The new faces are wonderful. Cute-Cute-Cute I can't wait to see the first snow of the season. OH MY GAWD!!!!! YOUR CARD IS AMAZING!! WOWY!!! I JUST LOVE LOVE LOVE IT!! This card is so cute. Now I am going to have to go and buy more stamps so I can try and make something so cute. It was so very nice of you to post the directions with the card. I love snow people and you really made them cute. Oh these are sooo cute!! TFS!! Thanks for the opportunity for blog candy! Thanks for sharing such cute ideas - those snowmen are adorable!! Super super cute! Would LOVE to win these, going to get them either way!! Cute Snowmen - thanks for the blog candy drawing! Love this adorable card!!! I *need* that stamp set! Thanks for sharing!!! Simply adorable! You just want to pinch the cheeks of those cute little snowpeople. Great job! Thanks for sharing. I just love your creations and the PK stamps... tks for sharing. Love the new face stamps, thanks for sharing! Your tutorials are great. Great ways to use those punches and I love the new faces! Love the card. It is "Snow Cute!" Herby is adorable!!! And I'm loving this set of PK stamps! Your card is darling, and I'm going to scraplift for sure. Thanks for being a great hop stop! Yes I am lovin them. Now to win a set!! Cute card! very cute snowmen Those are defintely on my list to get! adorable!!! These are so wonderful! Thanks for all the info on the how to do. This is so cute! I love everything you create - you are an inspiration! What a cute card.. thank you for showing us how you made it,, I will have to try it. I don't currently own any peachy stamps but that is gonna have to change... They are so darn cute..I just adore your blog, very helpful, just started making cards a few months ago and have learned so much form everyone in this blog world.. Awesome job, love the Snowmen..
Love, love, love that stamps set and your card is absolutely adorable. Thank you for the chance in this giveaway! 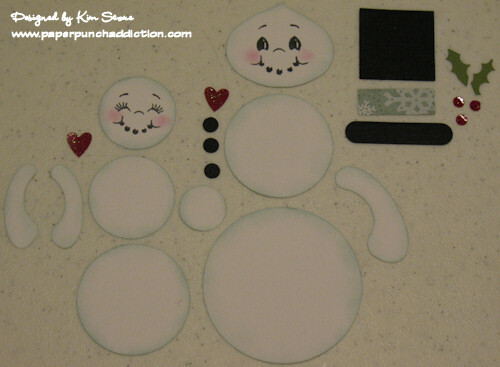 i love the card.. very cute..
Love your snowman and woman, I love anything made with punches, and the faces are so cute! Kim, your card is adorable. Thanks for the detailed instructions. I signed up for your emails, and love that email button. The snowmen are sooo cute and I LOVE this new stamp set :) TOTALLY AWESOME!! Your snowmen are so adorable.. I really want this stamp set.. Thank you so much for the chance to win.. Awesome Job!! I just think it is adorable!! TFS!! These new stamp sets are just amazing and I love seeing all of the creative projects coming from them - thanks so much! Wow you are so creative, I love what you did just using the punches! I just became a follower! I will be back to see one of your tutorials! The snowman is just too cute you did an awesome job with this card! I am sooo happy for you that Herbie is part of the new line up he is super cute! This is my favorite set so far you made an awesome card! Super great tutorial. Too cute!!! The snowmen are adorable. Thanks for sharing. These are SO CUTE! I love the faces! This is such a cute stamp set. Perfect for all the winter snowmen. Beautiful card! Love the snowmen! Adorable is the first thing that comes to my mind. Love your work! Your card is adorable!!! It's amazing how you paper punched the snow people! I have all of those Stampin' Up! punches, so I guess I'll give it a try. Wow! What amzing work with punches! How clever! They are just the cutest snowmen I've ever seen!!!! SO Super CUTE!!! I love it! Beautiful card! Thanks for sharing and the chance to win! Love your snowmen! They turned out so cute! Love the snow couple! What a great technique with the circle punch! Thanks for the inspiration! Very cute snowpeople! Love them! thanks for the great hopping fun, and the opportunity to win! I am lovin' these Snow Cuties!! Thanks for the chance to win some!! Love the card!!! This is my favorite stamp out of all the new releases...thanks for the chance to win! Oh so cute! You just want to pinch their little faces! Those snowmen are adorable. I can't believe how crafty people get with punches. Great job. Those faces are perfect with them. Love there cute little faces thank you for the fun snow day! Oh wow, too cute! Great work and thanks for sharing! Thanks for a chance to win also! They are so cute! Thanks for sharing and the chance to win! I just love snow people! They are SO cute! Ooh pick me, pick me I have dying to own a set of peachy keen face stamps. Love your snowmen and I can make them since I have all those punches except the stamps. Thank you for sharing. Wow, U have done it again.. You are so creative!!! They are soooooo cute!!!!! thanks for the tutorial. Kim you did such a great job! i absolutely love your snowman! You punch art truly is amazing! tfs! adorable snowman card. i would love to win anything. Thanks for the chance. Love your snowmen!! They are just tooooo cute!! Thanks for sharing. really cute snowmen. I love snowmen. So hope to win. Oh these snow men are sooooo cute. I really love their faces. Your card is beautiful. Those faces are darling. I really like all the new sets. But I love your card and the wonderful directions you gave for making the 'snowman friends'!! Thank you so much ! Super cute! What a great way to use all those punches that most of us have so many of! Adorable project! Thanks for the chance to win! I absolutely love your snowman and woman! Sooooo cute! Excellent snowmen! This is my favorite of the releases. This hop is so much fun! I love the tent card with these little snowpeople. With so many snowpeople to make over the winter holidays, I'm glad to see I will have some cute faces for them. Thank you for the inspiration. very cute! I love snowmen! And I love the new face stamps! You got to play with fun stamps! Girl you are amazing.. with this punches... love your creations.. they are adorable..
Awwwweeee...is the first thing I thought when your blog opened up. Those snowmen are so sweet! I love the face on the snow people. So cute - and thanks for the very detailed instructions, complete with the photos. How sweet these snow people are. The little hearts make me want to say "ahhh". Each new idea makes this sport more fun. Yes, it is a sport and my husband is being a good sport about it, no question as I order more and more. I love these new "snow cuties" stamps. Your card is so cute. Oh, you make such cute items! I am going to try these guys! WOW you are amazing what you can do with punches!!! and when you add the PK stamps...WOWOWOOWOW!!! Those face stamps are my favorite of the the new ones!!! I love your card. The cut out looks so great.